From the pyramids at Giza, to Stonehenge, to Machu Picchu, it is no coincidence that all of the longest lasting human structures are made from stone. Stone lasts forever, is natural, and is readily available in the environment. When it comes to outdoor landscaping or interior applications that see a lot of use and moisture (i.e. kitchens and bathrooms), natural stone is often the most durable and lowest-maintenance choice for surfaces. Unlike wood, plastics or composite materials, stone will not rot, mildew or disintegrate over time. From granite, to marble, to slate, read on to find out more about how natural stone can help you create a more beautiful and sustainable home. The stone walls at Saksaywayan outside of Cusco, Peru, are still in great shape after 1000 years! As I argued in my article Resilient Design is Green Design, the ability to stand the test of time is the epitome of sustainability. Out of all of the building materials that humans can utilize to create structures, stone is the longest lasting, and for this reason, the most sustainable. Architects and builders have always held stone in a high regard due to its durability, aesthetic, and ease of maintenance, but one of the most compelling reasons for homeowners to consider stone is its environmental sustainability. And this doesn’t just mean “sustainability” in the stereotypical treehugger sense of low carbon footprint, but also the material’s ability to endure over time. Unlike bricks or concrete, natural stone requires no baking or heating and is a fully formed, finished product upon extraction. This means no additional CO2 needs to be released in producing it. Natural stone also doesn’t have toxic chemicals like VOCs that can off-gas into your home, polluting the indoor air, unlike synthetic surfaces such as carpeting and vinyl. If positioned optimally within a house, natural stone has the ability to passively heat and cool a home due to its ability to store heat and release it gradually. And of course, the biggest appeal to most homeowners is that natural stone has an incredibly long lifespan with very low maintenance, which means that you are not going to have to refinish it, replace it, or send it to a landfill in 15 years. Natural stone typically doesn’t show dirt and wear and tear in the way that materials such as wood, gypsum board or vinyl do. It doesn’t easily get scratched, waterlogged or stained, and is easy to clean. An imperviousness to moisture makes materials like limestone, marble, and slate popular choices for bathrooms, while sturdy, scratch-proof, and easy-to-clean granite is an obvious choice for kitchen countertops that endure sharp knives, liquids and food spills (and the microbes that come with them). 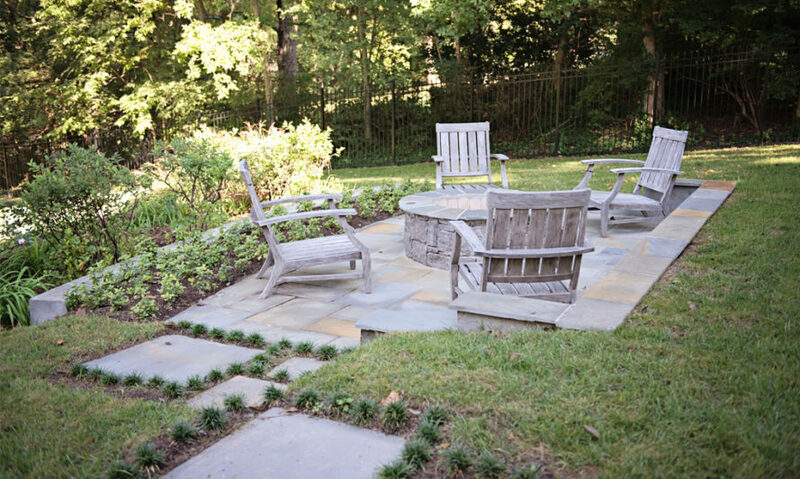 Outdoors, designers like to use stone for everything from patios to walkways, retaining walls to landscape planters. Stone’s longevity and durability makes it a smart investment that, if cared for properly, means it won’t need to be replaced. This keeps wasteful, synthetic materials out of landfill. Stone is a natural material that comes straight from the earth, unlike most other commonly used building materials. How the stone is quarried, processed, and transported affects its environmental footprint, as does the distance the stone must travel to get to you. The kinds of natural stone endemic to where you live are likely to differ from those found in other regions, but with so many different types of stone available, finding something local that fits your taste and budget should be fairly easy. Gneiss, granite, limestone, marble, quartzite, sandstone, and serpentine are all common to North America and exist in a range of colors and textures. Consumers who value environmental sustainability will be happy to know that there are stone quarry sites within 500 miles of nearly any building site in the United States and Canada. 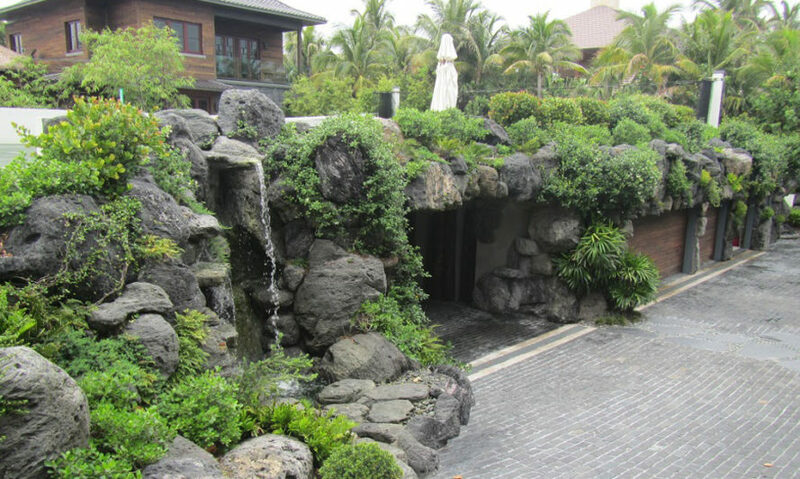 photo courtesy of Matthew Giampietro, Waterfalls Fountains and Gardens Inc.
As Mother Nature’s original green building material, natural stone is the best material available when it comes to withstanding the elements and aging gracefully outdoors. Because of its ability to weather harsh changes in temperature and moisture conditions, landscape designers prefer stone for everything from patios to walkways, retaining walls to planters. Natural stone can add charm to your yard or garden by adding a sense of timelessness. While concrete, wooden decking and other manmade materials often impose rigid lines and hierarchy onto the nature world, stone fits organically into nature’s design. 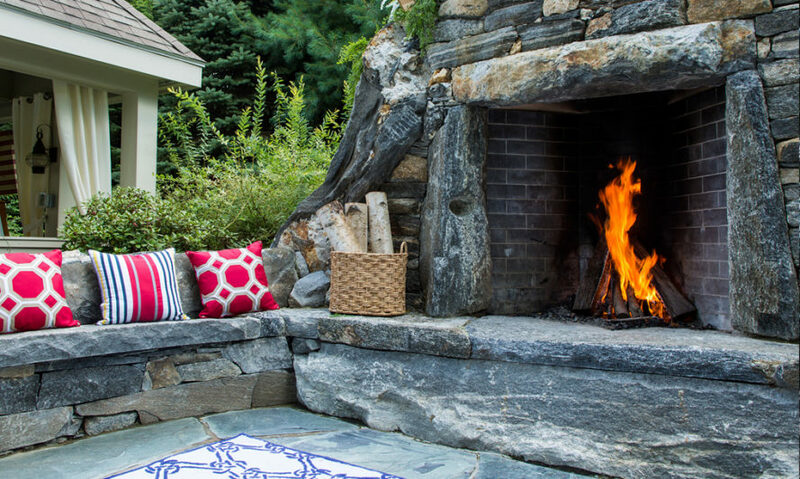 Stone is also just the most long-lasting outdoor material, hands down. Since it won’t warp, rot or disintegrate over time, it’s an ideal choice for withstanding weather, biological and environmental stresses. Termites, beetles and funguses may enjoy munching on wood, but they can’t eat stone. Stone doesn’t erode over time with wind and rain, unlike soil. While ceramics like brick and concrete are porous and can crack and absorb water, most types of outdoor stone are much harder, and generally last longer. For outdoor patios and walkways, the choice often comes down to stone, brick, wooden decking, or gravel. Gravel is inexpensive and easy to work with, but erodes over time, needs constant raking to look nice, and is often tracked into the house. Wooden decking provides a nice warm feeling to the touch, but need to be sealed and stained on a regular basis, and still eventually will give in to dry rot. (Trust me, I just fell through a rotten board on my wooden deck the other day, and it wasn’t fun.) Concrete has the advantage of a smooth, even surface, but it needs to be poured and can also contribute to flooding and water runoff where it doesn’t allow proper drainage. While stone is one of the most expensive outdoor materials, it has the advantage of long life and durability with little maintenance. Depending on how it is installed, spaced stone pavers can also allow greenery and soil to break up the hardscape, providing a green look, and allowing water to drain naturally. 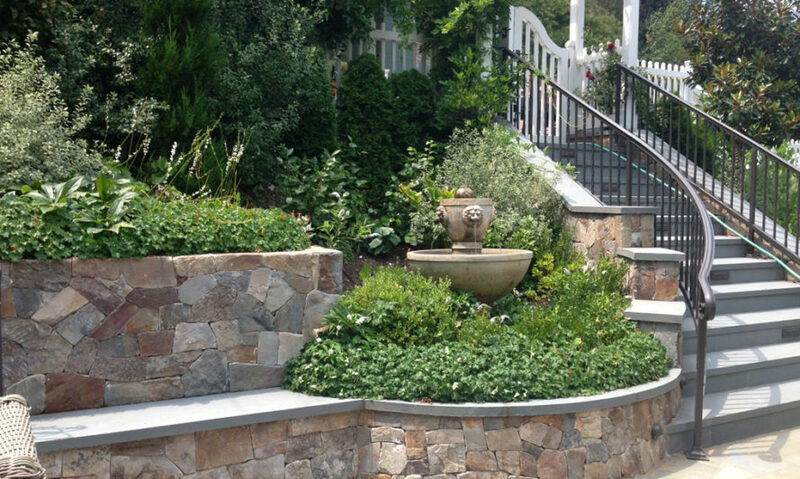 For retaining walls and raised planter beds, stone can’t be beat. Landscape plants and trees need a constant supply of water, and that irrigation can lead to erosion of soil and to the disintegration of competing materials, like wood, over time. Strategically placed stones can reinforce the shape of your designed landscape with retaining walls and berms, preventing soil erosion. Although it is heavier and more expensive than wood, natural stone makes a far more durable and long-lasting material for planters. Stone is as resilient indoors as it is outdoors. From the kitchen countertop to the bathroom floor, natural stone is easy to clean with mild dish soap and water, is naturally slip resistant, and is one of the most durable surfaces on the planet. According to the Natural Stone Council, stone can last more than 100 years with proper maintenance. Its lifecycle continues beyond the life of a building, because of the fact that it’s so recyclable and can be reused in so many other applications. Stone is a great flooring material for high traffic areas, because of its innate durability. Stone is pretty hard to scratch or damage, and any damage that does occur tends to be hard to see due to color variations and texture. Unlike vinyl or wood, natural stone will hardly ever show a scratch or be dulled, and needs only regular sweeping or vacuuming to look as good as new. If you are considering radiant floor heating for your home, stone is the best material to combine with that type of heating system due to the natural ability of stone to absorb and retain heat (and not absorb moisture). One might not immediately think of stone as a common wall surface aside from a kitchen backsplash, but walls can be a great use for recycled and salvaged stone. 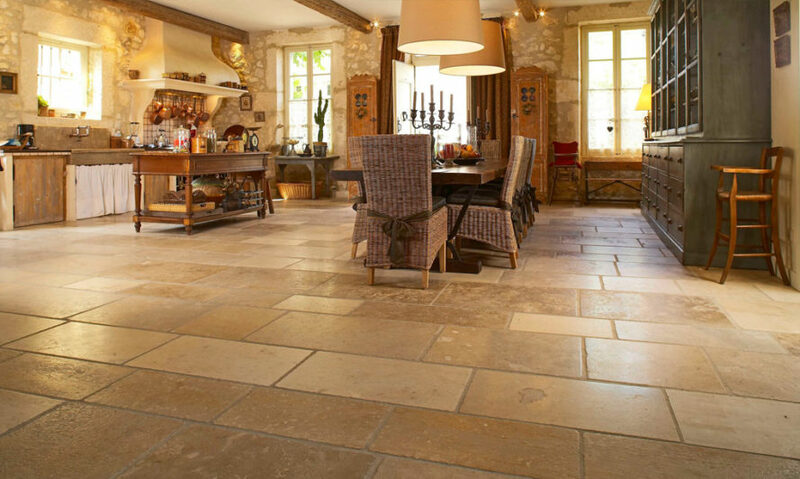 Stone walls, like stone floors, are very resilient, can’t be easily damaged, and don’t show fingerprints and dirt. Stone is also readily recyclable. Old stone buildings can be deconstructed and used for retaining walls, and small flat stones can be repurposed in mosaic wall designs. If there’s one room in the home that takes the best advantage of stone’s imperviousness to moisture, it’s the bathroom. From limestone showers, to pebbled shower floors, to slate sinks, to marble countertops, stone is easy to clean, resistant to wear, and in many cases, highly resistant to staining. Stones used for bathroom applications must be pretreated to prevent damage from bath products, cleaning products, and water, and must be resealed regularly. If maintained properly, natural stone is a long term investment that adds luxury, durability and character to any bathroom. 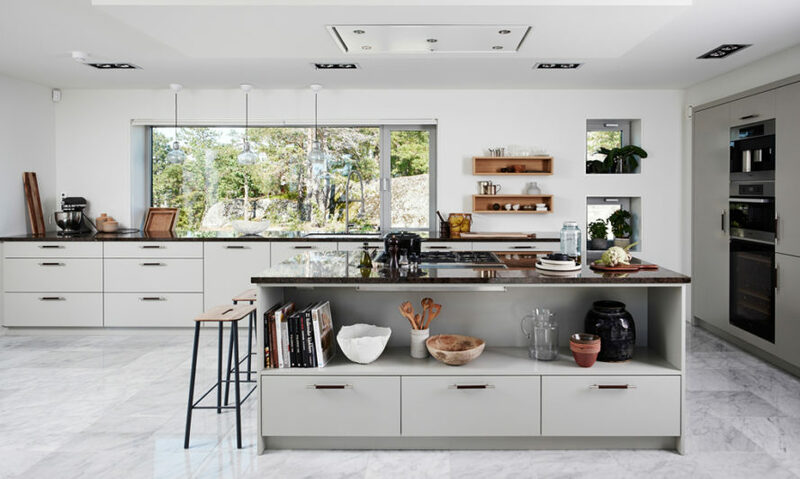 Many cooks are more passionate about their counter space than they are about their range, since countertops are where the bulk of the food preparation takes place. Countertops endure daily wear from a range of sharp utensils, spills, extreme temperatures, and mechanical force, causing synthetic materials to wear over time and become dingy. Granite and marble are ideal materials for kitchen countertops because of their sturdiness, imperviousness to moisture and heat, and lack of absorption (which makes them easier to keep clean and hygienic). Very difficult to scratch and easy to wipe down, granite helps keep bacteria at bay, making it the counter material of choice for those who are serious about cooking. Its inherently cool temperature makes it ideal for working on with pastry or pizzas, and a resistance to warping under high heat makes working with hot dishes a breeze. 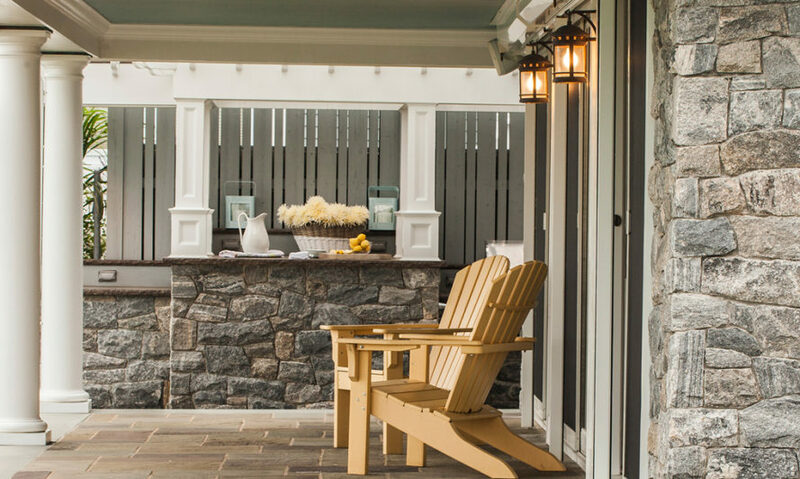 The bottom line is that stone is a great choice throughout any part of a house for durability, quality, low-maintenance and environmental sustainability. 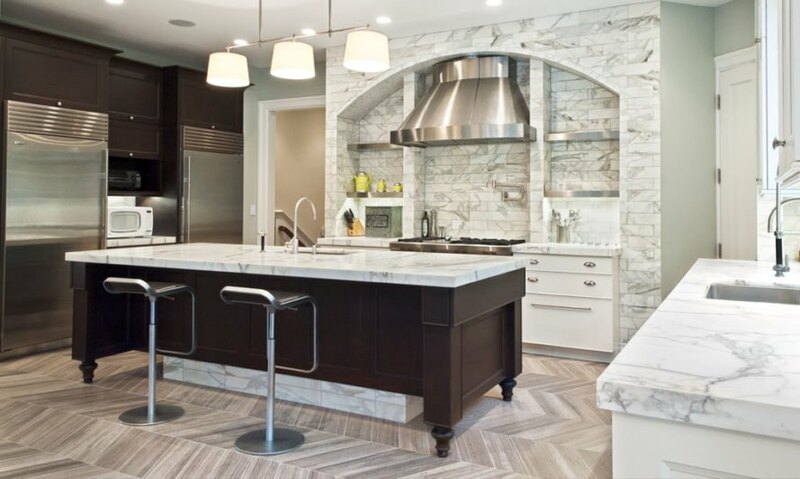 To learn more about different types of natural stone, check out the Natural Stone Institute. 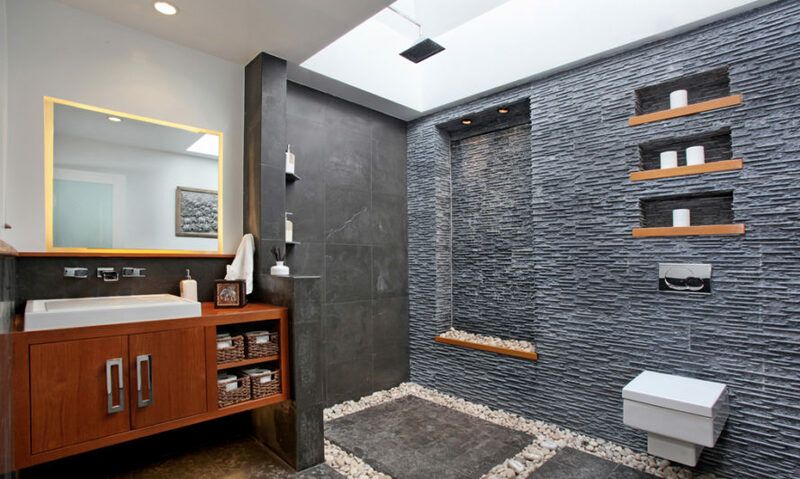 Using stone in bathrooms is awesome. You get this feeling that you're bathing in a forest under a waterfall surrounded by soft stones and it brings you closer to nature. the sand on the beach used to be a stone/rock somewhere else. Nothing last forever, though stone structures will outlast mans realm. Whayt I am confused about is iof we class petroleum extractiona nd energy use as non sustainable because it is use it once, and not again, how can cutting a rock out of the earth be anything but the same. Rocks are formed by geological processes and take millenia to form. Your kitchen bench is a use once product not sustainable extraction for Mother Earth. Timber on the other hand takes 30 to 100 years to be replensihed, and is truly sustainable product in our homes. Out of all of the building materials that humans can utilize to create structures, stone is the longest lasting, and for this reason, the most sustainable. 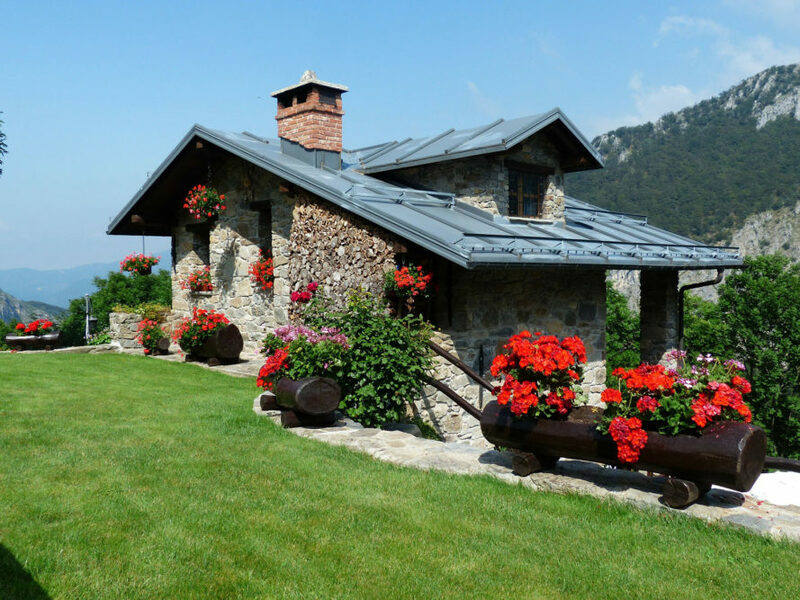 As Mother Nature’s original green building material, natural stone is the best material available when it comes to withstanding the elements and aging gracefully outdoors. 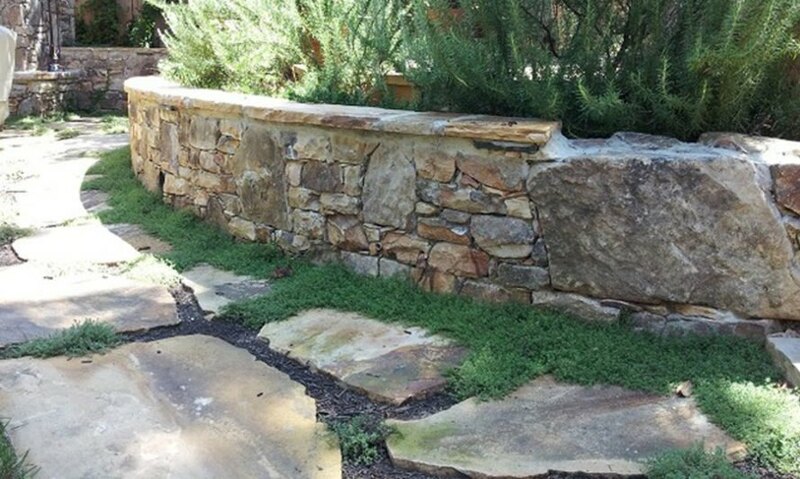 Because of its ability to weather harsh changes in temperature and moisture conditions, landscape designers prefer stone for everything from patios to walkways, retaining walls to planters. Image via Matthew Giampietro, Waterfalls Fountains and Gardens Inc.